Love the way this one turned out. 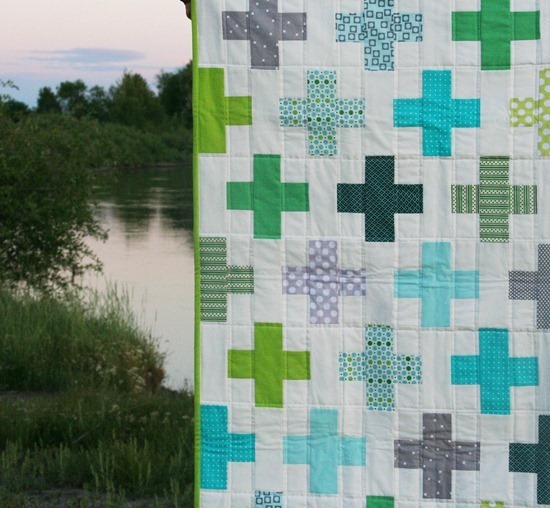 This pattern definitely calls for simple quilting, and straight lines here and there did just the trick. It is a very simple pattern, but if you need the math done for you for 6 sizes you can find a pattern here. The back is this fabulous print from the Denyse Schmidt collection at Joann’s. I bought 2 yards of this the first time I saw it because I love it so much as a back…or pillows. I love this quilt! Aqua, blue and green might be my favorite colors of all time! Gosh I love this quilt! I feel like I say that about everything you make. The binding is just about the perfect green and looks great. Seriously, have you ever made anything ugly?? Oh my goodness that quilt is so cute. I can't even stand it. So fresh and pretty! Love your fabrics! Great pictures by the water! I live near the beach and never take pics there I should. The quilt is just beautiful! love the quilt and the photo location is perfect to show it off! Your blog has inspired me to make my very first quilt! Thank you! I'm going to use Pooches and Pickups (or whatever it's called!) for my son's room. I don't think I'll be able to make them as quickly and as beautifully as you do, but it's worth a try! I plan to purchase your Easy Bake Pattern for my next quilt (it's addictive). But what I absolutely LOVE about your blog is that you're not a "fabric snob." You definitely showcase some amazing designer fabric. But you also highlight some of the the great finds from JoAnn (where I almost always have a 40% coupon in my purse!). I love the "high low" design aesthetic. I LOVE this little quilt. I LOVE the backing…dang I probably missed the opportunity for some of that plaid…it was way so cute! I LOVE your color combination! Thanks for all your great inspirations…can't wait to make a bizzy kid quilt! Love this quilt! I love the colors you put together. What a perfect block to show off these cool colors and prints. Love that backing fabric too. SO pretty! I love the backing!! And the simple quilting is perfect!! Lovely quilt. The fabric you used for backing looks great. Nice quilt and I do love that backing fabric too. I have to agree with everyone. This turned out fabulous. And I love the backing fabric. Lovely quilt. I too love the colors. And what a perfect setting for showing it as well. This quilt is adorable. I agree with you about the quilting! Where'd you get this pattern. I would love to make a cross quilt for my boyfriends mom. Absolutely lovely!! Love your backing – I'm using that fabric for a binding soon. I just finished a different style of plus quilt if your are interested…. Lovely! The color combination is perfect, so fresh and clean. Prettiness! I'd love to wrap up in this one! The colors all go together so well. Good Job! Haven't been able to find Denise Schmit at my JoAnne's guess I'll have to keep looking. Such a sweet quilt. I'm IN LOVE with that backing fabric!!! 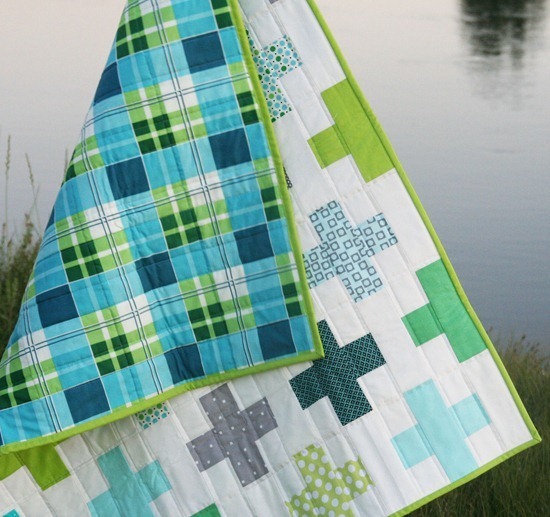 Love this quilt and the backing is perfect for it! The colors are so refreshing. It will always say "summer", don't you think? And you couldn't have found a better match for a backing. Thanks for sharing. Very nice, Love the colours. omg! MY Quilt! Because these are MY colours. I absolutely love love love this quilt! Thanks for the pleasure for my eye. So pretty and pleasing to the eyes! Great quilt! I think the backing makes it! I want to make this. It is great! I need a 'boy' pattern. love the colour choices. Great quilt. A beaut! I think my husband will love a quilt made from this pattern. It's beautiful! I love the backing! Love this quilt, then I see the backing and I am left without a term higher than love to use… whatever that is, thats what I think of this backing…uber love! Fabulous! Love the colours and especially those DS fabrics. Yum. I love it! I have those DS fabrics too and now I'm itching to cut into them. That's a great pattern too. I'm sure you have it listed somehwere, but for some reason, I can't see it now. Do you have a place for us to upload pictures of finished quilts using your patterns? I have 2 of your patterns finished (and more in the works). I am IN LOVE with how they turned out! …and I used to say I wasn't a quilter! I guess I'm quickly changing my tune. Lovely quilt. The print on the back is a perfect choice. what a gorgeous quilt! i love the simplicity of it and the blue and green and white goodness. great finish, as always! Beautiful! Do you by chance have a pattern or tutorial for this? I looked on your pattern and tutorial pages, but couldn't find anything. Love this. The colors are great too. I would love to know where to find a tutorial or pattern for this. 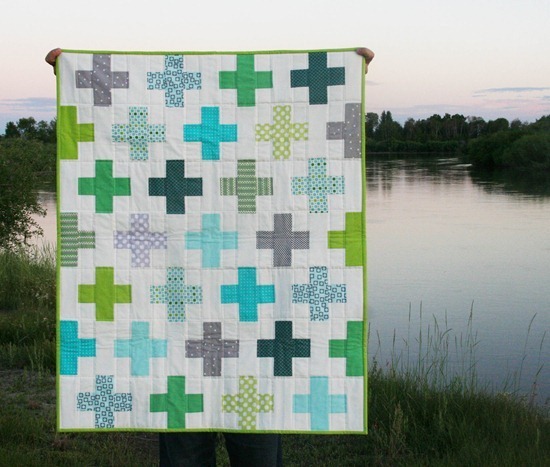 It is nearly impossible to find a plus sign quilt with the pluses spaced. I’m also hoping to find a pattern for this quilt. I can’t seem to find where you linked it. I love the offset crosses. Please help!